More Than Just Pizza! The NEW Seafood Menu at Rizzuto’s of Westport Focuses On Fresh, Local Fish. Washington Prime: You Certainly Will Eat and Drink Well Here! Looking for a whale of a brunch? Sign of the Whale has you covered. Best of…Brunch? Table 104 Osteria & Bar, Stamford. Donut Crazy Will Make You, Well, Crazy for Donuts! Looking For Somewhere to Celebrate National Tequila Day? Try These Fairfield County Favorites. Today’s Thursday and that means it’s STEAK DAY at Dew Drop Inn! Bodega Taco Bar Brings Their Street Food To…The Streets With A NEW Food Truck! ﻿Low-Calorie and Low-Sugar Spa Waters Items at Robeks Until July 10th! Enter To Win A Pair of Tickets to the 5th Annual Greenwich Wine + Food Festival HERE! Get Fezzier With A New And Vibrant Stamford Favorite! Grand Re-opening Of The Fez on Aug. 15th. Get Your Chowda Fix On Today at Chowdafest! CT’s FIRST Annual Foodtruck Festival Is Rolling Into North Haven July 19 & 20! When Life Hands you…Ripe Bananas, Make Banana Bread. Ebelskivers – it’s what’s for breakfast! This Cake is Crumb-y, and I Like It Like That! I was driving along Route 25 today and what did I spy? 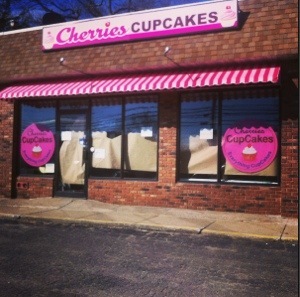 A new sweet shop that’s opening soon in Newtown – Cherries Cupcakes & Treats! When I pulled in the parking lot to snap this photo the owner came out to say hello. She was so friendly she even offered that I peek inside the shop. Cherries will be opening this upcoming week on Wednesday, March 20th. I can’t wait to stop in a try a sweet treat!